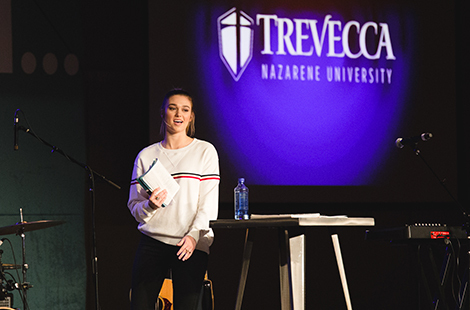 Sadie Robertson spoke in Trevecca’s chapel service yesterday, urging students to embrace the fullness of God’s character, stepping out in faith when He calls despite fear. Acknowledging the fear and anxiety students may face, Robertson urged them to remember who God is and trust Him because who He is shapes who we are and defines our true purpose. True confidence, Robertson said, comes from trusting in God, not ourselves. The “Duck Dynasty” star, who first visited Trevecca’s campus in 2013 and spoke at TNT@TNU, is now the author of several books, including a New York Times bestseller, Live Original. Robertson launched a tour of the same name in 2016 and has since traveled the country sharing her message, which is meant to encourage teens and young adults to embrace the full potential of who God created them to be and calls them to live. Last fall, Trevecca and Trevecca Online served as one of the main sponsors of Robertson’s Live Original Tour. The 16-date tour included stops in Tennessee, Atlanta and Myrtle Beach, S.C. In addition to writing and touring, Robertson also appeared on season 18 of “Dancing with the Stars,” as well as movies God’s Not Dead 2 and I’m Not Ashamed.